Stage performances of classic fairy tales should offer fresh, innovative takes on the familiar stories they showcase. “Rodgers and Hammerstein’s Cinderella” at the Fox Theatre checked off all those boxes. This musical adaptation was a fun treat for audience members young and old with its twists, beautiful costume design, choreography and vocal performances. Everyone knows Cinderella’s story. Ella (Kaitlyn Mayse), the stepdaughter of cruel stepmother Madame (Sarah Smith), wishes to escape her life as a servant in her own home and attend Prince Christopher’s (Lukas James Miller) ball. With the help of Marie (Zina Ellis), her fairy godmother disguised as a homeless, old lady from the village, Ella gets her chance to find love — as long as she finds it before midnight. The musical production deviates slightly from the age-old classic by spending more time developing its characters. An unexpected moment of self-reflection occurs during the musical’s first act, when Prince Christopher, who goes by Topher, laments about not knowing who he truly is in “Me, Who Am I?” Where the original fairy tale had relegated its other characters to the sidelines, the remake provides many scenes like Prince Topher’s. Across the board, the writing of the musical bolsters rich character growth. From the musical harmony that develops between Ella and her stepsisters after they return from the ball in “A Lovely Night,” to Ella’s eventual friendship with stepsister Gabrielle (Natalie Girard), who finds her own forbidden love with the fiery Jean-Michel (Nic Casaula), characters defy their roles in the traditional fairytale. The characters give life to an often retold (and sometimes tired) story, and adds weight to its message while maintaining the high energy throughout the performance. There are also moments that strayed from the original and elicited surprise from the audience. For example, Cinderella picks up her dropped slipper as she flees from the ball instead of leaving it for Prince Topher to find, forcing him to hold a banquet to bring Cinderella out of hiding. Still, the core message of “Cinderella” remains the same: one must be determined and push through what may seem “Impossible,” as Marie sings in the aptly named number. This time, however, the message extends beyond the perils that Cinderella endures to fulfill her destiny of marrying Prince Topher; the show also highlights the struggles that the lower-class citizens of the kingdom face after the deaths of Prince Topher’s parents. Dire times compel the temporary government, run by adviser to the throne Sebastian (Christopher Swan), to seize land from the citizens of the kingdom, thereby igniting revolutionaries to action. Jean-Michel, quickly becoming a revolutionary, points out this injustice to the townspeople, calling on them to rise up in “Now Is the Time.” At the climax of the second act, Prince Topher addresses the citizens and decides to create a political system that involves their vote. The impoverished townspeople’s perseverance influences Prince Topher’s decision to radically enact changes in his kingdom for the good of those citizens. The show balances plot and music, with ballet-based choreography weaving through the exposition flawlessly. The dancers’ dexterity and fluidity even allow for more theatrical tricks, like when Marie, the fairy godmother, turns woodland critters into flipping footmen (Tyler Eisenreich and Gage Martin). Such quirks contrast the more emotional moments and make the show enjoyable. While much of the show is lighthearted and upbeat, the more somber moments make the outlandish tale more relatable. In songs such as “Loneliness of the Evening,” when Prince Topher and Cinderella lament their separation, and in “There’s Music in You,” as fairy godmother Marie consoles Cinderella and convinces her to continue her pursuit of Prince Topher, the cast demonstrates a breadth of emotions that adds dynamism to the tone of the show. “Rodgers and Hammerstein’s Cinderella” boasts the most extravagant costume design of any show or musical I’ve ever seen. Seemingly magical transformations took place on the stage, like Marie’s twirling transformation into the fairy godmother, and her conjuring of Cinderella’s glittering dresses from dirty rags. Whenever a magical transformation took place, an elegant Victorian-style dress would appear from out of nowhere, suddenly sparkling under the stage lights. The stroke of midnight, true to the original story, signals the reverse transformation; Cinderella’s finest dress disappears, and her famed golden carriage returns to its original pumpkin form. In addition to the awe-inspiring choreography and special effects, the constantly shifting and transforming set, designed by Anna Louizos, mystified the audience and set the tone for each scene. During Prince Topher and his knights’ hunt for the fleeing Cinderella, the forest moves with the company, creating the illusion that the band of knights is actually moving through a large wood. Other scenes set at Prince Topher’s palace showcase graceful set designs, with large arches dominating the stage. 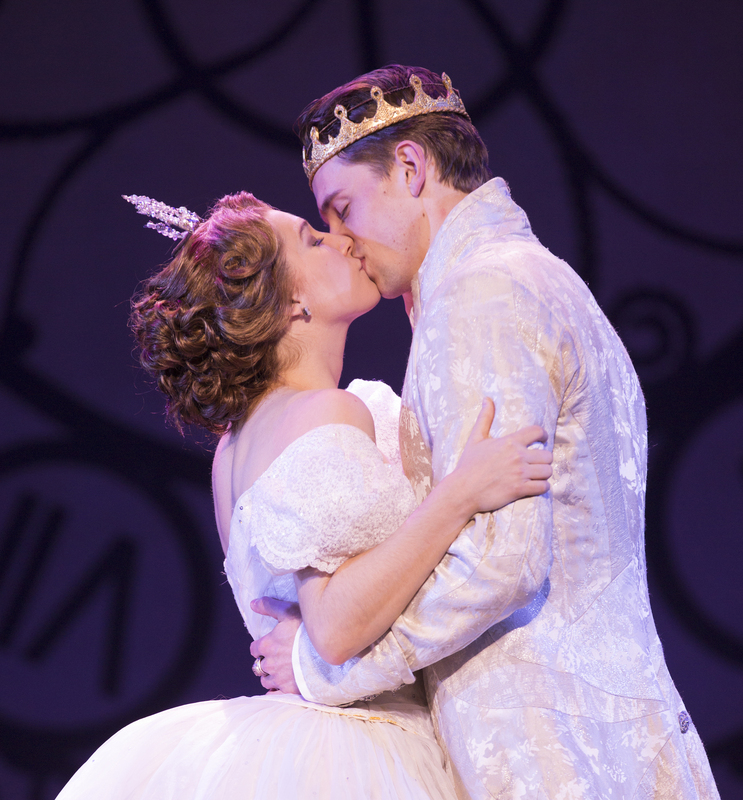 The post ‘Rodgers and Hammerstein’s Cinderella’ Transforms the Fox Theatre in Atlanta appeared first on The Emory Wheel.